Middle Gal is completely recovered from her ordeal, which is such a relief! You'd never think she just went through surgery 2 weeks ago! Thank you to all of you who were praying for her...your prayers are greatly appreciated! Anyway, I thought you might be interested in seeing what they have to offer. Click HERE to see everything. 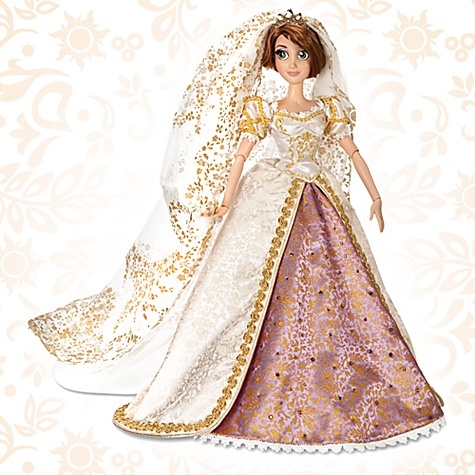 I'm thinking of getting the mini doll set with mini wedding Rapunzel and Eugene. What are your favorite items? A sweet pink and white bunny. I believe there are 6 different animals in all, if I remember correctly. They're already on #3 or #4 in our area, so if you're interested in adding these to your doll's stuffed animals, I would get to McDonald's sooner rather than later. For the record, I like the mini Ty Beanie Babies that McDonald's does a little bit better, but these guys are cute too. Next up, we have a doll-sized hand puppet...sort of. It doesn't actually fit over their thumb. My mom and I found these at Michael's. They're actually human finger puppets, but we think they work pretty well for dolls, too. Just today, I went into Salvation Army and found this adorable doll-sized radio for just $2.50. I didn't expect it to still work, but I put some new batteries in, and it worked perfectly! :) I'm thinking I'll probably put this in Maggie and Rachel's room. The handle can come up, just like a real radio. The speakers can also be detached, although I'll probably just keep them together. That's all for now. 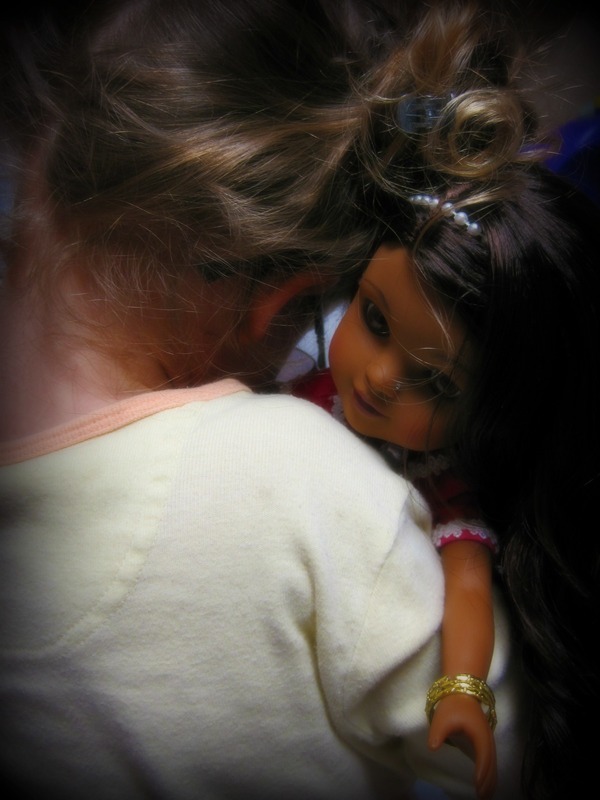 Have any of you found any doll-sized treasures lately? Okay, I'm almost wishing I hadn't said anything about "Once Upon a Time" after last night's episode. I'm so fed up with the way they're ruining Mary Margaret and David Nolan in Storybrooke! I found last night's Fairy Tale segment pretty interesting overall, although the siren scene was just creepy. I'm glad we got to find out what happened to Abigail and that, in the Fairy Tale world at least, she and Prince Charming parted ways on good terms. Anyway, I wanted to apologize in case any of you watched last night and were offended or surprised that I had cautiously recommended the series. And for those of you who haven't seen it, hopefully I haven't roused your curiosity just enough to make you go watch it now. If you do, just realize that I was very disappointed by the plot line from last night's show and would not recommend that episode in particular. Once again, nothing overly explicit was in it, but I was frustrated by the choices and character portrayed by the...um...characters. ;) My main interest in the show is to find out what happens to Rumpelstiltskin and Belle. Some Thoughts on "Once Upon a Time"
This is a post I've been working on all week, and I wanted to get it published before the next episode. Hope you enjoy it! Okay, I've been holding out on writing about this series because I wanted to see the direction it was going, but I admit it...I've gotten a bit hooked on "Once Upon a Time". WARNING: THERE WILL BE SPOILERS AHEAD! If you haven't watched this series and don't want to know anything about it before watching, I would suggest you skip this post. I'll try to warn you before the big spoilers, but there will inevitably be things I have to reveal as I share my thoughts. I was able to hold my ground for quite a while. I was a bit concerned with some of the content, and reluctant to get interested in a series that was written by guys whose last series lasted for EIGHT SEASONS!!!! ("Once Upon a Time" is written by the same guys who wrote "Lost", which I have not seen, by the way.) But after last week's episode, "Skin Deep", I could feel my resolve slipping. For those of you who are not familiar with the series, the basic premise is that every fairy tale story you've ever heard really happened. All of the fairy tale characters we know and love really existed in their own world. However, angry over Snow White's happy ending, the Evil Queen put a curse on the entire fairy tale world. Now all of the fairy tale characters are stuck in Storybrooke, Maine, where the Evil Queen resides as mayor. None of them know their true identities (except for the mayor and one other character), and only one person can break the curse: the daughter of Snow White and Prince Charming, Emma Swan. Emma was transported to our world via magical wardrobe (hmm, Narnia, anyone?) as a baby by her parents. Of course, she has no memory of her life as a fairy tale character, which could prove a daunting obstacle. And she's not in Storybrooke. Thankfully, her son, Henry, whom she gave up for adoption as an infant, finds her and takes her there. He's been given a book of fairy tales by his teacher at school and has connected the dots. Now all he has to do is convince Emma that the stories are true, and that only she can save them. Oh, and that his adopted mom is the Evil Queen from Snow White's story. Involved, I know. It's hard to describe. The idea is great, though. I was just a little concerned with what they'd do to all of my favorite fairy tales, so I tried to go into it very cautiously. I didn't want to get swept off my feet before I could properly evaluate everything. There are definitely some things that they got right on this series. The writing is great. At the end of each week, you find yourself dying to know what happens next! While the writing style can sometimes make it a bit difficult to remember details from past episodes, as they jump from character to character for weeks at a time, it definitely keeps you hooked! The stories have overall been much cleaner than I expected, too: not too much swearing, no explicit sexual content. Also, because ABC is owned by Disney, there are a lot of clever references to the Disney versions of the fairy tales that we've all grown up with. The acting is phenomenal, and the casting is superb. I haven't seen any character yet that made me think, "They just really don't look the way I imagined them." And speaking of characters, just who have we met so far? Snow White and her dwarfs, Prince Charming, the Evil Queen, Cinderella, Rumpelstiltskin, Jiminy Cricket, Red Riding Hood, Belle, and many, many more. The writers go "behind the scenes" of the fairy tales we all know so well and give us all sorts of extra information on what happened between the pages of their original stories. Of course, as is to be expected, the series has its faults. The most frustrating issue for me involves Snow White and Prince Charming. Because of the fact that no one remembers who they are in Storybrooke, some of the characters have been separated from each other, including Snow White and Prince Charming. It is believed, at least at this point in the series, that Prince Charming's Storybrooke counterpart, David Nolan, is married. SPOILER!!! (At the beginning of the series, David is in a coma, and when he wakes up, he doesn't remember anything. Right when he and Snow White's Storybrooke counterpart begin to get close, the mayor/Evil Queen conveniently shows up with David's "wife".) END OF SPOILER (SORT OF) Yet he "feels a connection" with Mary Margaret Blanchard (known as Snow White in the fairy tale world) that he doesn't feel with his wife. As a result, the two of them end up starting a relationship in spite of his marriage. It is not specified how far this relationship has gone, but they are at least very emotionally involved and have shared kisses and embraces. Now, I realize that they are truly married in the fairy tale world, and it's pretty likely that his "marriage" to this other woman is a hoax or a ploy set up by the Evil Queen to keep him and Snow White apart. That being said, I am so tired of TV shows or movies using the whole "soul mates" thing to excuse sin. If you're married, you need to be faithful to your spouse, both physically and emotionally. It doesn't matter if you find your "soul mate" after you're married. You have committed to your husband or wife and that's the relationship you need to be cultivating. If more people had this mindset, we'd have a lot less divorces and unhappy marriages in this world. I realize that in some situations, such as abusive scenarios, this just isn't possible. But on the whole, in a normal marriage relationship, this is God's design. We really don't need any more encouragement to "follow our hearts", especially when a romantic fairy tale couple is involved, which makes us feel all gushy inside and therefore justify their actions. There are also several characters that are known to be sleeping together, and while we don't see anything explicit (yet! Hopefully it will stay that way! ), this is treated as the norm, and even encouraged in some instances. Sadly, this has become the norm for most of society, so I suppose I shouldn't be surprised. There also have been at least a few innuendos (and probably more than that, as these tend to go over my head unless they're really obvious). I don't remember how much swearing there is. There have been at least a few instances of some swearing, and a few improper uses of God's name. Alcoholic beverages are frequently consumed throughout the show. There are also some low-cut and otherwise revealing outfits worn by some of the female characters, especially the Evil Queen and Red Riding Hood's Storybrooke counterpart, Ruby. The other thing is that there are some pretty dark themes and some violent content in some of the episodes. Because of this, I would definitely not recommend this show for kids. It's geared much more towards adults. Of course, when you read some of the original fairy tales, they were pretty dark and violent too. Something that comes up quite frequently is murder, and it's usually instigated by the Evil Queen or those around her. So what was it that finally got me really interested in this series? You won't be surprised. I watched Snow White and Cinderella's stories with interest, but I was able to remain fairly detached. Rumpelstiltskin and Jiminy Cricket's stories were interesting, but sad, too. The Magic Mirror, the Huntsman, Hansel and Gretel...all of them were interesting, but still I was doing well. Then, last week, they did Beauty and the Beast...and I was totally sunk. Are you shocked? ;) It was, in my opinion, the greatest episode yet (minus the annoying secondary plot with more on the Mary Margaret/David Nolan issue, and SPOILER!! the Storybrooke Cinderella character who got pregnant before marrying her Prince Charming! Grrr! 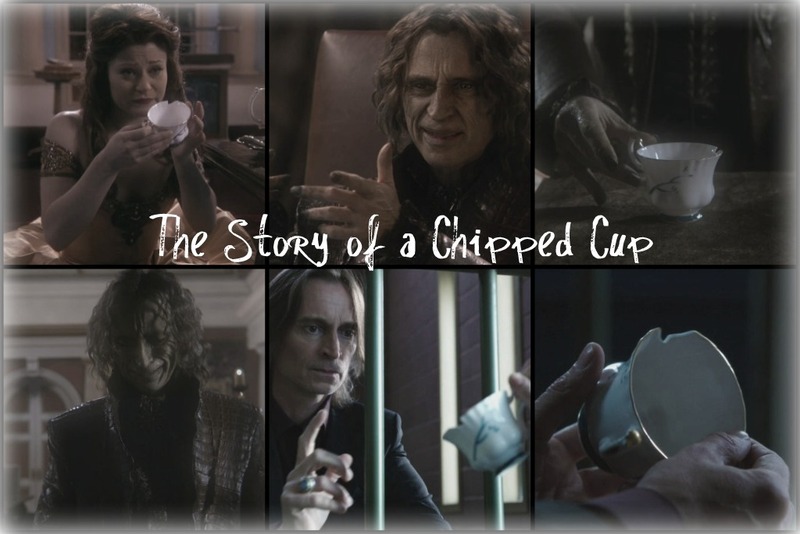 At least this didn't happen in the fairy tale world, but still...) END OF SPOILER I had my doubts at first when I realized that Rumpelstiltskin was going to take the role of the Beast. The episode was written so well, though, that it didn't take me long to love it. The writing, the acting, and the music all melded together to make one amazing episode! It seriously took me almost all night to wrap my head around all the little nods and references to Beauty and the Beast, but with twists of their own. SPOILER ALERT!! Sadly, this version did not have a happy ending, but there's still a chance that the story might resolve itself later on in the series! END OF SPOILER I'm on pins and needles to find out what happens. And apparently, I'm not the only one. 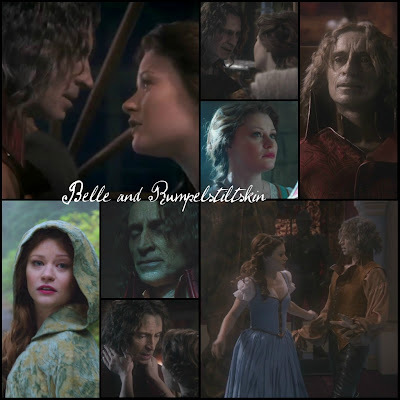 Just look up "Belle and Rumpelstiltskin" on YouTube, and you'll find dozens of fan videos celebrating the couple. 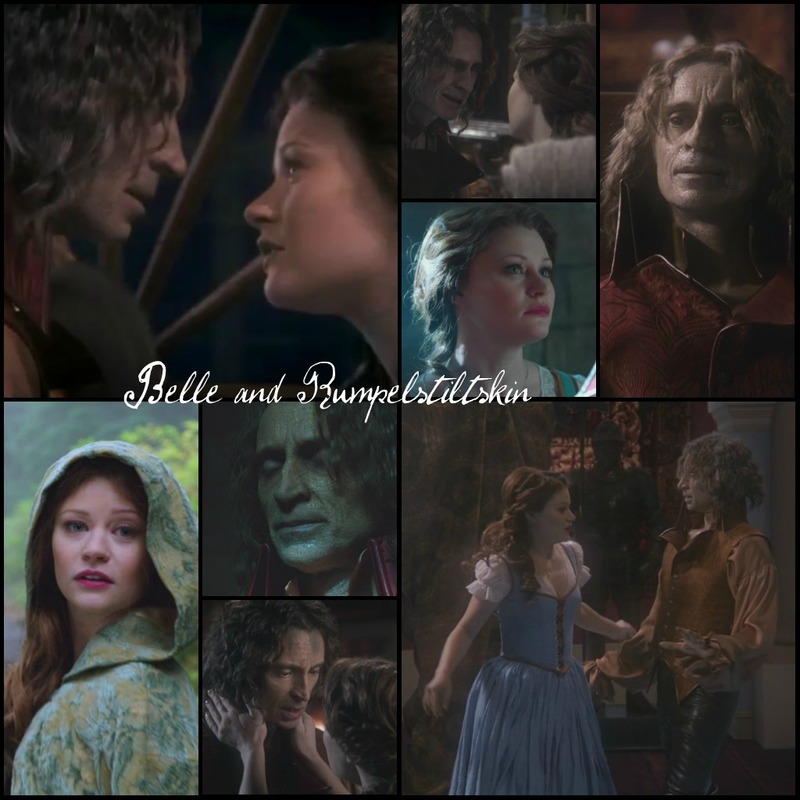 When Belle came into his life, he slowly started to remember his humanity. She brought back feelings that I'm sure he thought he no longer had. This episode showed a different side to him, a vulnerable man who had the capacity to love, if only he would let go of his bitterness and desire for power. We were also shown in this episode that he made another decision that he came to bitterly regret...a decision that still haunted him, even in Storybrooke. I think there's hope for Rumpel yet. In all the episodes about the Evil Queen, we've seen her make bad decision after bad decision. While she seems to have some feelings beneath that icy exterior, she is ruthless and never fails to crush all who get in her way. She is manipulative, power-hungry, and will stop at nothing to pursue her own interests. I think this is such a wonderful picture of us regular, non-fairy tale humans. ;) In our lives, we are daily presented with choices, and every choice we make affects our future path. The friends we make, the influences we follow, the books we read, the movies we watch, and the goals we set all determine who we become. We can choose to do what is right, or do what "feels good" and works best for us. And any of us who have been on this earth for a considerable period of time know that the more we keep giving into our selfish nature and to the evil influences around us, the easier it is to continue down that road. But, praise be to God, we do not have to redeem ourselves. In fact, there is nothing we can do to save ourselves. It is only by accepting Christ's sacrifice for us on the cross that we can be saved. And His death covers every sin that ever has been or ever will be committed. It may be difficult to choose what is right after years and years of doing what is wrong, but it is never impossible. No one is a lost cause. And I think that Rumpelstiltskin may possibly end up being an illustration of that. The problem is, he's going to have to make the right decision first...and that could be a pretty tough choice. Even as followers of Christ, we are not immune to the pull of sin and the world. It is a daily struggle to yield to Christ and His will for our lives. Thankfully, when we fall, we need only to confess our sins to our Savior, and we can start fresh again. I think that's why, especially as I get older and become more acquainted with my struggles and failings, I tend to appreciate less-than-perfect heroes and heroines. I've come to love characters who can be used for good in spite of their flaws, who learn from their mistakes and move on. I would like end with a word of caution to my younger, unmarried sisters in Christ. It is so easy to get caught up in a story like this and not think about the tragedy of giving our hearts to someone who does not share our faith. I think that as women, we have a natural desire to "save" someone when we see their potential. Think of all of the stories that pull at our heartstrings, like "Beauty and the Beast", "The Phantom of the Opera", "Jane Eyre", and more, where the main character is a tortured soul with a capacity for goodness. May I just encourage you to keep these sorts of relationships for your stories and stay away from them in real life? You will avoid so much heartache if you do. Of course, there is nothing wrong with befriending and witnessing to someone who needs to know about the love of Christ. But dating or courting someone with the soul purpose of converting them almost never works, and once your heart is involved, it's harder and harder to let go. How sad to share your life with someone who may not ever be able to relate to what is most important in your life! Okay, getting down from my soapbox now. ;) I just know that it's easy to get caught up in the romance and excitement of stories like these without thinking about the dangers of seeking that sort of a relationship in real life. Hi everyone! I feel like I've been gone for ages, although most of you probably figured I've just been busy with birthday preparations. If only that were the case! As you all know from my last post, "Middle Gal" celebrated her 6th birthday on Wednesday the 15th, and was looking forward to her first "friend party" with her school friends today. Well, sometimes the Lord has other plans. Let's just say that there will not be a party here today. Perhaps in another week or so. Thursday morning when I got up, Middle Gal asked me to please make breakfast soon because her tummy was hurting, which is pretty unusual. While I was making breakfast, she came and told me that her "hip" hurt. I told her to try going potty to see if that was the problem. She was able to go, but still felt bad. By the time I finished breakfast (only about 15-20 minutes after I'd first woken up), she was hurting so badly that she only managed to eat her vitamins and about 2 bites of toast. I sent her to her bed and continued working on my breakfast. Over the next few minutes, she got worse and worse. She was clutching her right side and wailing. She even threw up several times. I gave her a warm sock full of beans to put on her "owie" and then left a message on my mom's cell phone to let her know that Middle Gal wouldn't be at school today (usually my mom watches Little Gal on Thursdays so that I can go help in Middle Gal's class). Then, just out of curiosity (because I never can remember), I went online to check which side of the body the appendix was on. I've tried to be really in tune to that because Hubby had a horrendous experience with a ruptured appendix as a child, and I've always worried that I something like that might happen to my kiddos. At this point, I decided to risk waking my mom up and called her home phone. I explained the situation, and she suggested calling the doctor on call (our doctor's office wasn't open for the day yet). I took her advice and called, leaving a message explaining the symptoms. I didn't have to wait more than about 5 minutes before my call was returned. The doctor said it sounded like it could definitely be appendicitis, and told me I should probably I take her to the Emergency Room, just in case. So, within a half an hour, I was in the Emergency Room with my little birthday girl. My mom stayed with the other two, and after getting ahold of my husband at UPS, took Big Gal to school and watched Little Gal. Hubby met me at the Emergency Room, where we were put into a room fairly quickly. At this point, I was a bit nervous, because Middle Gal was acting almost normal. I almost felt like telling the doctors, "She was really acting like she had a problem with her appendix...honest!!" Especially since everyone's tone of voice seemed to convey their doubt that appendicitis was her problem. The doctor that saw us was very gracious, though. He assured me that I was right to come in considering the symptoms she'd had. The doctors weren't sure it was really appendicitis, especially since she wasn't running a fever and seemed to be in okay shape pain-wise, but they decided to do a blood test and a urine test, just in case. The urine test (which, by the way, was a complete miracle, since she had absolutely nothing in her tummy! It only took two tries, 4 large sips of water, and a quick Mommy prayer to make it happen!) came back clear, but her white blood cell count was up. During all of this, Middle Gal had another bad spell and threw up again. After conferring with another doctor and talking on the phone to one of the surgeons upstairs (which resulted in an odd test where they had Middle Gal jump up and down to see if her appendix area hurt), they decided that things were suspicious enough that she should be admitted. Middle Gal was given an IV and moved to Pediatrics, Room 4. In Pediatrics, we waited for several hours to be seen by the surgeon. At this point, my mom had dropped Little Gal off with Hubby's parents and had joined us at the hospital. This was a real blessing, because we could take turns going and getting something to eat. Middle Gal was not allowed to eat anything until they decided what they were going to do, so we didn't want to eat in front of her. Middle Gal looked up at him, as if she was wondering if he was serious. He was. She got out of bed and jumped once. She nodded, her pitiful poochy lip in place. She pointed to the same area on her right side that had been giving her trouble. "Yep, it's appendicitis," he said quickly. "That's the only thing that causes that to hurt when kids jump." He then went into a quick explanation of I don't even remember what...something to do with the upcoming surgery, and was gone in the space of 2 minutes. Mom and I were almost in shock. The nurse had made it clear that she was doubtful that appendicitis was the right diagnosis. The ER guys had been a bit doubtful, too, so we had pretty much assumed we'd be sent home. I have to say, though, I was somewhat relieved. Of course, no parent would ever wish surgery on their child. But I was so worried I would go home and have the same thing happen again, and wonder whether to go in again or not. I also knew of the dangers of appendixes rupturing, and I wanted to avoid that at all costs. Not long afterwards, two very sweet male nurses came in to transport her up to surgery. They asked her about her doll and her pony. One nurse even chatted about her "My Little Pony named Fluttershy" to another nurse in surgery. It was just the type of thing Middle Gal needed to put her at ease. We got to go in to get her paperwork ready and kiss her goodbye, and then they wheeled my baby away. An appendectomy is a fairly non-invasive procedure nowadays, and I knew we'd caught it early, so I knew that the odds were she'd be totally safe. But I still felt a whole lot better when they called my name and told me she was waiting for me in recovery. The procedure went really well. Apparently, her appendix was up really high, almost by her liver, so it took them a while to find it. I'm so thankful for the Lord's provision in this area. It might have been difficult to diagnose normally because of the location of her appendix. It was interesting, too, because one of the times the nurse asked her where she hurt, Middle Gal pointed up high on her side, which should have indicated something other than appendix problems. But it really was where her appendix was! You can't live your life that way, of course. But I definitely saw God's hand at work throughout the whole situation. Even the little details were taken care of, like all of the wonderful staff that worked with us, who were just the perfect personalities for my nervous little gal. God is good. Of course, He doesn't always choose to work things out that way, and He is still good, even when He doesn't. But I'm so thankful for His grace to our family throughout this entire ordeal. I'm so thankful to have a little one back in her own bed, well on her way to recovery. I'm so thankful for a God who cares. P.S. Just had to share this. I wanted to give you an example of how awesome the staff was. The male nurse who inserted Middle Gal's IV started by giving Nahji an IV (I'd brought Nahji with us for comfort). That way Middle Gal would know that it was going to be okay. (Can you tell he was a dad?) ;) All of them took such wonderful care of her. My middle daughter turned 6 today. I can't believe she's already that old! She's in Kindergarten this year, and is thriving in school. She loves to sing, dance, draw pictures, make up stories, play with her dollies, and use her imagination for all kinds of things. "Hey Hayden, I've got something for you." Happy Valentine's Day, everyone! :) I pray that you and yours have a special day together. My mom discovered another great eBay seller who makes adorable swimsuits for 18" dolls. I fell in love with the swimsuits she bought, so I purchased a couple for myself. :) The seller's name is mikyle207. You can view her items for sale HERE. She has many other adorable bathing suits available for very reasonable prices. Here are Hayden and Emma, modeling their new suits. Front view (sorry for the faded colors...I'm still trying to figure out how to fix that on my camera; the coloring is like the colors in the first 2 pictures). Hayden's shoes are the garden shoes from the Friends Boutique doll line at Walmart. Here's Emma's suit. This one makes me think of taking a Hawaiian vacation! :) I bet Kanani would love this. I love the fact that both suits are made with actual swimsuit material. While Hayden's is smooth, Emma's has ribbing in the material. Emma's shoes are from one of the Madame Alexander Friends 4 Life clothing sets from 2009. I would highly recommend these swimsuits, especially at such an excellent, reasonable price. Be sure to follow the link above and see her other items. There are many different colors and designs to choose from. 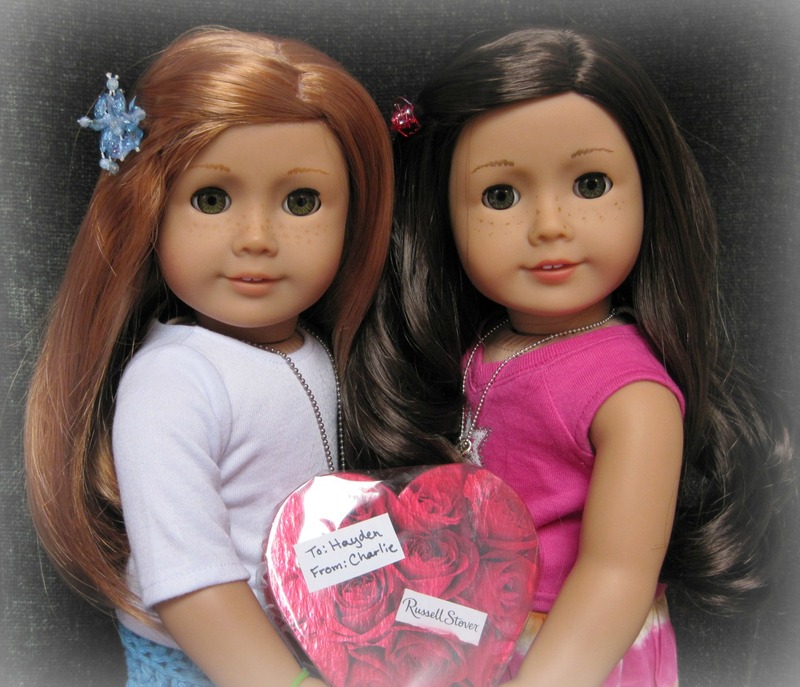 New Hearts For Hearts Girls Revealed!! The Hearts For Hearts YouTube account also some video footage from the 2012 Toy Fair revealing the new dolls. You can view the video HERE. There's also a video revealing the "Deluxe Editions" of Dell and Consuelo, and some new outfits for all of the dolls! :D You can see that video HERE. Arrgghh!! I am in the middle of TRYING to post one of my review posts for you guys, but Blogger is being INCREDIBLY slow right now. It's taking about 10 minutes to upload one picture!! Really, Blogger? There are a lot of great entries again this time around! I loved seeing all of the different holidays people chose to portray. Hats off to everyone! :) You can click HERE to see them all and cast your vote! :) Voting ends on February 19th. Hey guys! Just wanted to let you know that I've officially switched my username from "beast'sbelle" to just plain "beastsbelle", without the apostrophe (just in case anyone cares!). The main reason for this change is that I'm really tired of being labeled as "beast&39;#sbelle" (or something along that line) on some blogs when I comment...it's rather annoying! ;) It also keeps things simpler for me, because I have the username "beastsbelle" on several other sites, so now everything is the same. So here's my dilemma. My original plan was to wait to try to publish anything until all three of my girls were in school (which would be August of 2013), but my idea is perfect for the current market. Should I forget my original plan, or should I stick to my plan and not worry about the current trends? I want to think very carefully before I make a decision. I would hate to rush into trying to get my book published and then find I was in way over my head. I feel like I'm standing on the edge of a precipice, with a raging river below me, wondering if I dare to dive in or not. On the one hand, this story is very important to me. I've sensed the Lord's direction throughout my project and felt it was something that could be useful and enjoyable to others. The characters are as real to me as if they were truly flesh and blood. I would love to see them come to life, to introduce them to the waiting world! The other downside to going ahead with my project is that I would have to majorly slow down on my blogging. I would still try to have at least a little update post up each week, but many of my photo stories and things would have to be fewer and farther between. I love my blogging!! I don't want to have to choose between the two, but at least for a time, I'd most likely have to. I do so desire to follow the Lord's leading through this. I don't want to jump out ahead of the game without consulting Him and trusting His guidance. And yet, at the same time, I don't want to wait and hem and haw so long that I miss the boat. Just pray that I will be able to make the right decision...for me, for my family, and for everyone. Okay, enough thinking out loud! I'd better stop before I bore all of you to death. ;) Thanks for following this rambling, random post. I'll be in touch soon! P.S. 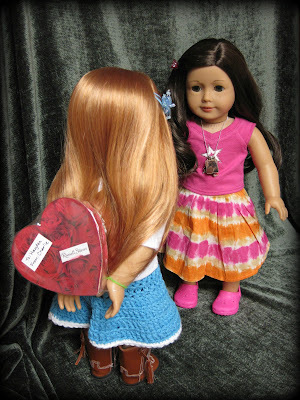 I almost forgot...tomorrow, 3 new Hearts For Hearts Girls dolls will be revealed on the Hearts For Hearts Facebook page! :D I can't wait!!! Hi everyone! Thank you for being so patient. Last week I had one of the worst colds I've had in a long time, so my blogging was pretty much nil! It's been a week since I first came down with it, and I'm finally starting to feel like myself again! Here it is as it comes in the store. And here it is out of the packaging. As you can see, the buttons are just for show. 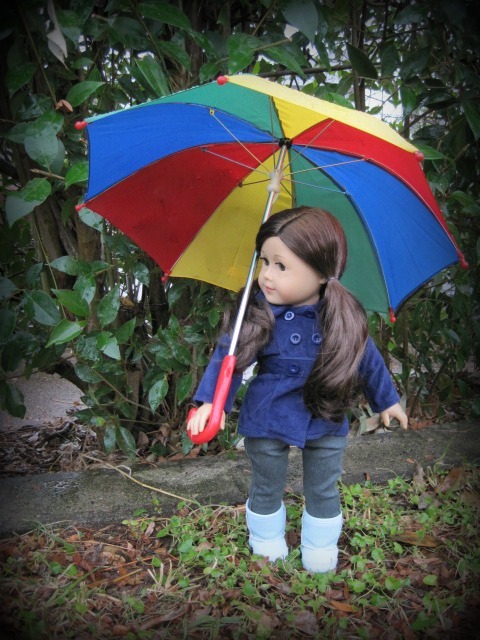 The jacket has Velcro closure, which makes it very easy for little hands to manage. The jacket is a lovely shade of deep blue that looks great with Emma's skin tone and eye color. Some of you may remember that this is the jacket Hayden was wearing in the picture I used for the Doll Wardrobe's Photo Contest (and also the picture in my header). She came in a cute pair of pjs with a very sweet note that her former owner had written. It may be a while before she's introduced on Tess and Maggie's blog. I want to take my time and really figure out her character and everything. I'm pretty sure her name is going to be Jenna Rose Benson. She'll be Rachel's 12 year old little sister. I also decided that she's going to be another Sanrio fan. As you can tell from the pic, her two favorites are My Melody and Chococat (just like Piper). ;) I found these adorable plush guys on eBay from the seller cleanitupandout. There are still some available. HERE is a link to Chococat, and HERE is a link to My Melody. :) You can also get Hello Kitty, Kerropi, and Deery Lou. First off, their hair is very different shade. Hayden's is much darker (and longer, too). Here's a picture of the hair color difference with the flash. 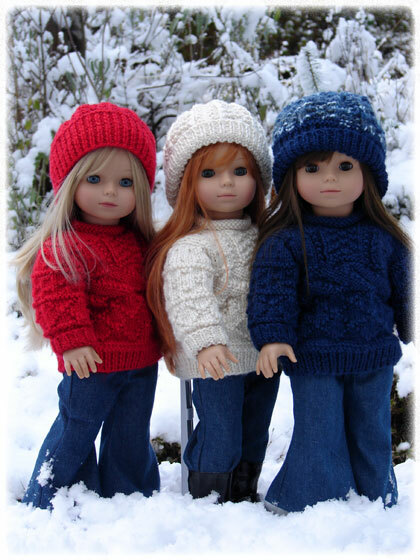 The other thing I was concerned about was the fact that I would now have 3 dolls with hazel eyes. Interestingly enough, though, I discovered that Jenna (aka Rebecca), Hayden (#55), and Charlie (aka Mia) all have a different shade of hazel. I wasn't sure if I'd be able to accurately capture the eye color differences, so I also did some close-ups of their faces. Once again, the order is Jenna (Rebecca), Hayden (#55), Charlie (Mia), and Emma (#41). It's very interesting comparing their eye colors. Rebecca's eyes appear to have some of the bright green from the Mattel Felicity dolls with a bit of brown added. 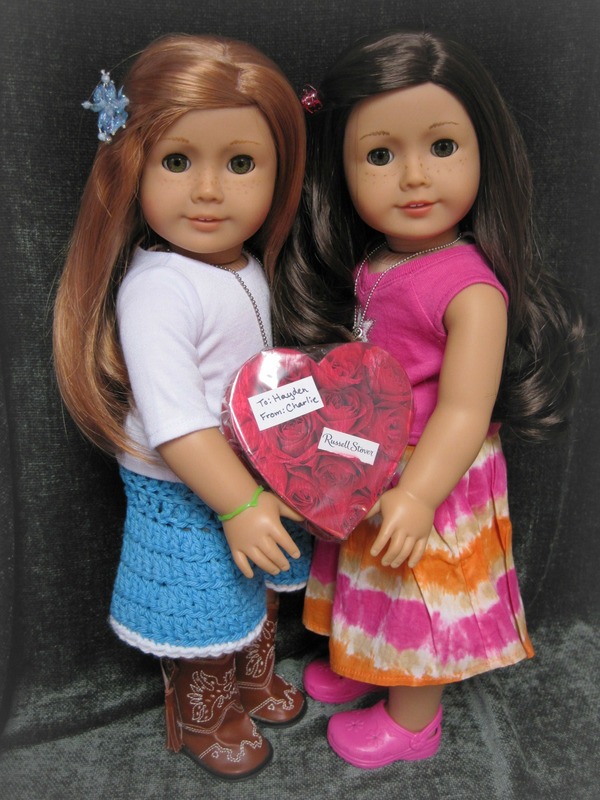 My AG #55 has a much darker shade of hazel, while Mia's eyes are more of a brownish-green hazel. My AG #41's are a beautiful deep green. I wasn't sure if I would stick to my original idea of having Rachel and Jenna be sisters, but these pictures confirmed it. They don't look all that much alike, but I think I can see a bit of family resemblance. ;) Especially since they're both Josefina molds.